The classic English trifle layers sponge cake, fruit, and custard. On Easter Sunday, I used a traditional Cajun bouillie (egg custard) plus some Louisiana strawberries, excellent balsamic vinegar and angelfood cake, to create dessert with a little local flair. The oh-so Italian combination of balsamico and strawberries saves the trifle from unbearable sweetness; toasted almonds add textural interest and a nutty counterpoint complementing the berries. Try your own variation with blackberries and nutmeg-spiked custard, or blueberries and lemon custard. Place sliced berries in a mixing bowl; add sugar to taste and balsamic vinegar. Stir and set aside to macerate for 10 minutes. 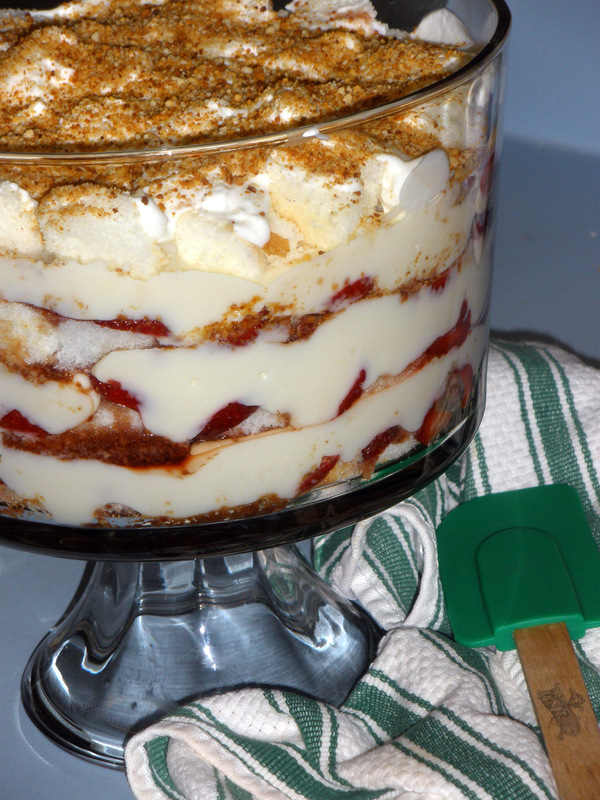 In a deep trifle dish or bowl, spread a single layer of cake cubes to cover the bottom of the dish. Add a layer of sliced strawberries and a few tablespoons of the collected balsamic juice mixture. Next, sprinkle on a few sliced almonds (or a few teaspoons toasted almond flour), then spread a layer of custard atop. Repeat the cake, fruit/juices, almond, and custard layers until the dish is filled or you run out of ingredients. Top with whipped cream if desired; sprinkle with almonds for contrast. Refrigerate for several hours before serving.